Let’s revamp Calendars & Time! How arbitrary is that? And you know I think you’d be hardpressed to find 10 people that actually know when each of the four seasons begins. The only one I know off the top of my head is the winter solstice, and that’s only because the Mayan calendar conspiracy nonsense. But hey, ending a calendar year at the winter solstice makes a lot more sense than a random 10 days after it. Basically what you need is to figure out the amount of days within each season and divide those equally into months, and you’ll have to account for a leap year somewhere in there too since the mean tropical year (solar days) is 365.2422 while the veneral equinox year is 365.2424 days and they don’t play nicely together. The idea is that rather than starting the year in the middle of the winter in January, it would make more sense to start it at the beginning of Spring, and end in Winter. That’s how a year feels like it progresses, yes? It begins in Spring then reaches its conclusion in Winter. Further, the months themselves would line up with the seasons so that every 3 months starts the next season exactly on the start of the month rather than some arbitrary dates thrown in the middle of various months. To be technical, we would be lining our calendars up with the Earth’s two celestial Solstices and Equinoxes. 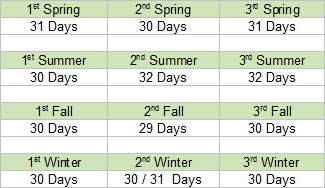 The only important thing is that the seasons from Spring to Winter should have the following days: 92, 94, 89, and 90/91. How you divide each of those up isn’t terribly important. In fact, to be perfectly honest you could even go so far as to eliminate the 12 month calendar all together and instead go for a 4 season calendar with the aforementioned days included respectively. “The 87th day of Spring,” “The 17th day of Fall,” and so forth. Personally, I think that makes a lot of sense too. So now that we got the new months out of the way – which by the way, you could call whatever the heck you want, now we’re going to move on to the days themselves. Let’s say you wake up and the sun’s just coming up. But you don’t know what season it is. Without looking anywhere, do you know what time it is? Probably not. The same could probably be said about the time that it gets dark. It’s just an arbitrary time when it happens, and it changes roughly by a few minutes daily throughout the month. By about 2 or 3 minutes a day or so, vaguely depending on the month and where you live. But 7AM in the Summer certainly doesn’t look like 7AM in the Winter. So let’s fix that. What would be more obvious than dividing the day into two periods: Light, and Dark. Light begins when, well… when the light begins! And Dark? Yeah, that’s it. You’re already catching on – right when it starts to get dark. So let’s go back to that scenario. With this type of time scheme, if you wake up and don’t know what season it is but you watch the sun come up then you know it’s 0:00 Light. Convenient, eh? Time per regions differs more literally than is adjusted via our timezones, so we’ll need to make a few more timezones to get this right. And overall, we can’t adjust for the exact minute that the light comes up or goes down because that would just be a synchronization nightmare. So, we’ll have to round to the nearest accurate hour. That brings us to DST corrections. We’d need some of those too. Every month would be most accurate, but every 2-3 months or so would likely suffice. It doesn’t really matter which one, just some form or another of daylight time correction would need to be in place to account for the minute discrepancies not accounted within the day measurements for ease of synchronization. So what do you think? It’d be pretty cool, huh? We’d need to make some new clocks and calendars of course, but overall I think it’d make a lot more sense.